Whether a producer strictly grows row crops or raises cattle, utilizing the corn residue as a forage has long been an option for not only cows but also for growing heifers and backgrounding calves. 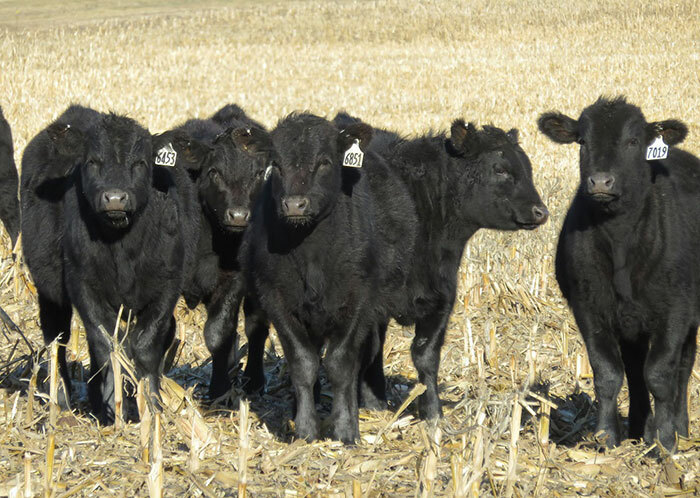 “Given the typical rental rates for corn residue and the cost of distillers grains, these two feed resources together make one of the lowest cost growing rations,” begins Mary Drewnoski, Nebraska extension beef systems specialist, before discussing how ruminant animals utilize protein in a recent Beefwatch newsletter. Drewnoski explains that ruminally degradable protein is used by rumen microbes to grow and that these microbes eventually become an added source of protein themselves as bacterial crude protein. Supplying more ruminally degradable protein than an animal’s microbes require is ineffective because the excess can’t be utilized by the animal, Drewnoski says. Animals with a higher protein need, such as calves, may not meet their protein demand with just bacterial crude protein. When this happens, ruminally undegradable protein, or bypass protein, is needed. For animals with high protein requirements, distillers grains are an excellent source of protein. Drewnoski cites a 2016 comparison of urea and distillers grains as an added source of protein for growing calves wintering on corn residue. “Urea is 100 percent ruminally degradable, whereas the protein in distillers grains is only 37 percent ruminally degradable, meaning that 63 percent of the protein bypasses the rumen (is not degraded in the rumen) and can be absorbed later during the digestive process,” Drewnoski says. The beef specialist cites a feeding trial where calves were given supplements equally balanced for energy (3.1 pounds of total digestible nutrients per day) and protein (0.9 pound of crude protein per day). The calves on the distillers grains diet gained more than double what the calves did on a corn and urea diet. This disparity is due to the effect of bypass protein, or ruminally undegradable protein, on growing calves. Because of this, Drewnoski recommends distillers grains as an added supplement to calves grazing corn. She states that not only have they traditionally been the Midwest’s cheapest source of protein but they also contain more energy than just corn because they are a more accessible, concentrated form. • 1.1 pounds per day, calves would need to be supplemented with 1.8 pounds of dry matter (DM), which is 2 pounds of dry distillers or 3.6 pounds of modified distillers. • 1.5 pounds per day, calves would need to be supplemented with 3.6 pounds of DM, which is 4 pounds of dry distillers or 7.2 pounds of modified distillers. • 1.9 pounds per day, calves would need to be supplemented with 6 pounds of DM, which is 6.7 pounds of dry distillers or 12 pounds of modified distillers. “In forage-based systems, similar performance is observed with dry, modified, and wet distillers grains as long as the same amount of dry matter is fed,” Drewnoski says. That said, these results were found in a bunk feeding system. Drewnoski stresses that ground feeding is more wasteful and, therefore, distillers grains feeding rates must be increased. “In trials evaluating ground feeding, waste of 5 percent was measured for modified distillers, 20 percent for wet distillers, and as much as 40 percent for dry distillers when compared to bunk feeding,” Drewnoski says. There are many sources of supplemental feed for growing calves wintering on corn residue. But, when it comes to reaching intended daily gains and meeting protein requirements, distillers grains have an economic and performance advantage.